This past week we were able to attend the 2018 Nevada Mental and Behavioral Health Symposium. The Symposium’s theme, “Suicide is Everybody’s Business”, was a call-to-action for professionals who are key leaders in suicide prevention to come together and focus on a community approach to prevention. Suicide affects communities on all levels, and prevention, as explained by the multiple speakers at the Symposium, must be addressed in a simple, unified format that can be implemented by friends, family, and providers alike. Enter the Columbia Protocol, or Columbia-Suicide Severity Rating Scale (C-SSRS). The protocol, developed by Dr. Kelly Posner Gerstenhaber and her team from Columbia University, has been implemented across the globe in thousands of public health settings, saving lives in 45 nations across six continents. By adopting the C-SSRS, organizations ensure that one tool is being used by all caregivers, creating a common language that helps communicate what the patient needs. The C-SSRS is shown below in an easy to implement chart form. I was lucky enough to hear from Dr. Posner Gerstenhaber herself during her keynote address at the Symposium. In it she broke down the simplicity of the C-SSRS and addressed the first step for anyone hoping to implement the Protocol: knowing when to use it. The stigma of suicide is all around us. It’s a topic that has been pushed under the rug and under-discussed in the general community…But sometimes just one voice reaching out and asking the right questions can be enough to prevent a suicide. The first step in suicide prevention is awareness, or knowing when someone is in crisis. 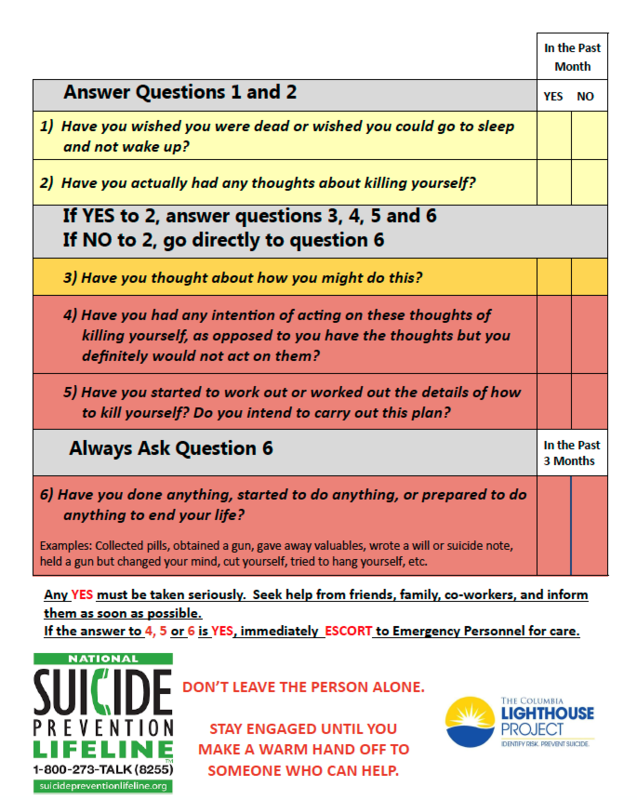 It’s not easy to identify if a loved one or co-worker is contemplating suicide, but the Columbia Protocol’s plain language and simple questions may make it easier to talk to someone you think is suffering. The answers to these questions provide enough information to determine whether someone needs help and if immediate action is needed. While National Suicide Prevention Week ended just under a month ago, the conversation on suicide must continue. Keeping suicide awareness relative across all providers, responders, and the general public is key to increasing suicide prevention. Only by working together, in mutual understanding, can we push to reverse the rising trend of suicide in our communities. For a deeper look at the Columbia Protocol, follow the link to The Columbia Lighthouse Project homepage. And if you or a loved one are currently thinking of ending your life, please call 911 for immediate assistance, or call National Suicide Prevention Lifeline at 1-800-273-TALK (8255).